WASHINGTON – Joaquin Archivaldo Guzman Loera, known by various aliases, including “El Chapo” and “El Rapido,” was convicted today by a federal jury in Brooklyn, New York of being a principal operator of a continuing criminal enterprise – the Mexican organized crime syndicate known as the Sinaloa Cartel – a charge that includes 26 drug-related violations and one murder conspiracy. Guzman Loera was convicted of all 10 counts of a superseding indictment, including narcotics trafficking, using a firearm in furtherance of his drug crimes and participating in a money laundering conspiracy. The verdict followed a 12-week trial before U.S. District Judge Brian M. Cogan. Guzman Loera faces a mandatory sentence of life imprisonment. Acting Attorney General Matthew G. Whitaker, U.S. Department of Homeland Security Secretary Kirstjen Nielsen, Assistant Attorney General Brian A. Benczkowski of the Justice Department’s Criminal Division, U.S. Attorney Richard P. Donoghue for the Eastern District of New York, U.S. Attorney Ariana Fajardo Orshan for the Southern District of Florida, Acting Administrator Uttam Dhillon of the U.S. Drug Enforcement Administration (DEA), FBI Director Christopher Wray, Executive Associate Director Derek Benner of U.S. Immigration and Customs Enforcement’s Homeland Security Investigations (HSI) and Acting U.S. Marshal Bryan T. Mullee of the Eastern District of New York, announced the verdict. As proven at trial, Guzman Loera was a principal leader of the Sinaloa Cartel, a Mexico-based international drug trafficking organization responsible for importing and distributing vast quantities of cocaine, marijuana, methamphetamine and heroin into the United States. The evidence at trial, including testimony from 14 cooperating witnesses; narcotics seizures totaling over 130,000 kilograms of cocaine and heroin; weapons, including AK-47s and a rocket-propelled grenade launcher; ledgers; text messages; videos; photographs and intercepted recordings, detailed the drug trafficking activity of Guzman Loera and his co-conspirators over a 25-year period from January 1989 until December 2014. 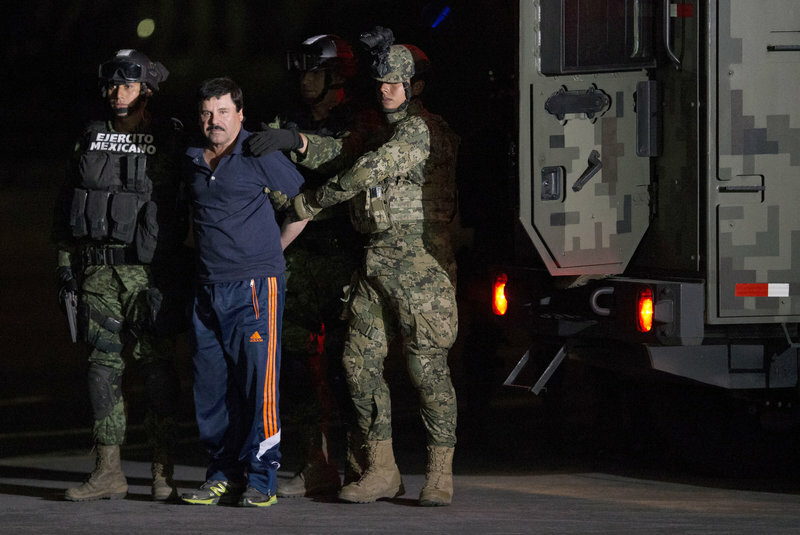 Guzman Loera was repeatedly referred to by witnesses as one of the leaders of the Sinaloa Cartel. Guzman Loera oversaw the smuggling of narcotics to wholesale distributors in Arizona, Atlanta, Chicago, Los Angeles, Miami, New York, and elsewhere. The billions of illicit dollars generated from drug sales in the United States were then clandestinely transported back to Mexico. Guzman Loera also used “sicarios,” or hit men, who carried out hundreds of acts of violence in Mexico to enforce Sinaloa’s control of territories and to eliminate those who posed a threat to the Sinaloa Cartel. In the course of the decades-long drug trafficking conspiracy, the Sinaloa Cartel transported tens of thousands of kilograms of narcotics from Central and South America for distribution in the United States. Guzman Loera used various methods to transport the cartel’s narcotics into the United States, includingsubmarines, carbon fiber airplanes, trains with secret compartments and transnational underground tunnels. Multiple witnesses testified about seizures by law enforcement officers of massive amounts of cocaine, heroin and marijuana linked to the Sinaloa Cartel. One of the largest seizures of drugs bound for the United States involved over seven tons of cocaine concealed in jalapeño cans. The jury also heard recordings of Guzman Loera’s own damning words discussing his drug trafficking, corruption and violence. The calls included Guzman Loera discussing sending “ice,” meaning methamphetamine, to Los Angeles, California; Minneapolis, Minnesota; Ohio and Tucson, Arizona. Guzman Loera also utilized a sophisticated encrypted communications network to operate the global narcotics trafficking operation. As an information technology engineer testified at trial, Guzman Loera paid him one million dollars to purchase and set up a network to enable the defendant to communicate via the internet with his drug trafficking associates in Colombia, Ecuador, Canada and the United States without fear of being intercepted by law enforcement or his rivals. The witness devised a secret and secure system, consisting of encrypted cell phones and encrypted apps. The success of the Sinaloa Cartel relied upon the use of violence to maintain their power throughout the region and beyond. Numerous co-conspirators testified that Guzman Loera directed his hitmen to kidnap, interrogate, torture and shoot members of rival drug organizations, at times carrying out acts of violence himself. A former hitman testified that Guzman Loera beat two men with a tree branch until their bodies “were completely like rag dolls,” before shooting the men and ordering their bodies be tossed into a bonfire. The former hitman also testified that Guzman Loera interrogated a rival drug cartel member, shot him and ordered that he be buried alive. In an intercepted call, the jury heard Guzman Loera order one of his sicariosto kidnap rival cartel members, but not to kill them without first checking with him. The evidence presented at trial demonstrated that to further the interests of the Sinaloa Cartel, Guzman Loera and his organization took advantage of a vast network of corrupt government officials. These officials ranged from local law enforcement officers, prison guards, state officials, high ranking members of the armed forces, as well as politicians. These corrupt officials assisted Guzman Loera and his organization in exchange for millions of dollars’ worth of bribery payments. For example, according to the testimony of several witnesses, in many instances, Guzman Loera and his workers were warned of pending law enforcement operations which allowed Guzman Loera to avoid capture on multiple occasions. In other instances, Guzman Loera, through his employees, paid officials to turn a blind eye to trafficking activities in an effort to facilitate the shipment of drugs, weapons, and bulk cash. Guzman Loera’s lucrative drug trafficking business generated billions of dollars in illicit proceeds. Guzman Loera used various methods to launder money including bulk cash smuggling from the United States to Mexico. One of the largest seizures was of $1.26 million seized from hidden compartments in a truck driven by Guzman Loera’s brother in Douglas, Arizona in 1989. In addition to the bulk cash smuggling, Guzman Loera oversaw numerous shell companies, including a juice company and a fish flour company to launder the cartel’s narcotics trafficking proceeds. When sentenced by Judge Cogan, Guzman Loera faces a mandatory life sentence without the possibility of parole for leading a continuing criminal enterprise, and a sentence of up to life imprisonment on the seven remaining drug counts. After the verdict, the government will seek a forfeiture money judgment for billions of dollars constituting the cartel’s illegal drug-trafficking proceeds. The government’s case is being prosecuted by U.S. Department of Justice Trial Attorneys Amanda Liskamm, Anthony Nardozzi, Michael Lang and Brett Reynolds of the Criminal Division’s Narcotic and Dangerous Drug Section, Assistant U.S. Attorneys Gina Parlovecchio, Andrea Goldbarg, Michael Robotti, Patricia Notopoulos and Hiral Mehta of the Eastern District of New York and Assistant U.S. Attorneys Adam Fels and Lynn Kirkpatrick of the Southern District of Florida. The case was investigated by the DEA, HSI and the FBI, in cooperation with Mexican, Ecuadorian, Netherlands, Dominican, and Colombian law enforcement authorities. Substantial assistance was provided by the U.S. Attorneys’ Offices in the Northern District of Illinois, the Western District of Texas, the Southern District of New York, the Southern District of California and the District of New Hampshire. The Department of Justice’s Office of International Affairs also played an integral role in securing the extradition of Guzman Loera to the United States, in cooperation with authorities of the Mexican government, without which his extradition and prosecution would not have been possible. The investigative efforts in this case were coordinated with the Department of Justice’s Special Operations Division, comprising of agents, analysts and attorneys from the Criminal Division’s Narcotic and Dangerous Drug Section; DEA New York, DEA Miami, FBI Washington Field Office, FBI New York Field Office, FBI Miami Field Office; HSI New York, HSI Nogales; Bureau of Alcohol, Tobacco, Firearms and Explosives; U.S. Marshals Service; IRS Criminal Investigation; U.S. Bureau of Prisons, NYPD and New York State Police. This case is the result of the ongoing efforts by the Organized Crime Drug Enforcement Task Force (OCDETF), a partnership that brings together the combined expertise and unique abilities of federal, state and local law enforcement agencies. The principal mission of the OCDETF program is to identify, disrupt, dismantle and prosecute high level members of drug trafficking, weapons trafficking and money laundering organizations and enterprises.